With regard to vaccines, Paul has bought heavily into the antivaccine propaganda, claiming in 2011 that “I have heard of many tragic cases of walking, talking normal children who wound up with profound mental disorders after vaccines.” There is, of course, no link between vaccines and “profound mental disorders”. In fact, Paul clarified his comment a few days later, saying that “I did not say vaccines caused disorders, just that they were temporally related ... I support vaccines, I receive them myself and I had all of my children vaccinated.” Indeed, for all we know, Paul may, in fact, not believe that vaccines cause “profound mental disorders” (though the evidence is at best inconclusive and may have made the first comment just to appease the conspiracy theorists that tend to flock his events; it doesn’t matter – the mere willingness to cater to the antivaccine crowd in this manner makes you a serious loon. (In fact, the “temporal relation” claim is dubious, too.) In any case, Paul subsequently tried to frame his point, in typical antivaccine fashion, as a “health freedom” issue – what he opposes is really state- og government-mandated vaccines: “I think the parent should have some input. The state doesn’t own the children. Parents own the children.” Parents do not own their children. More recently, Paul has come out in support of conspiracy theorist and antivaxxer Michael Snyder’s run for Congress. 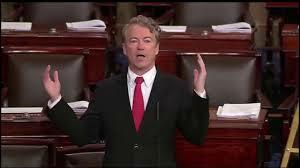 There is a decent Rand Paul resource here. Still seems to be the better of the two Kentucky Senators. Sadly the "Twit-In-Training" is utterly cracked, but not as badly as Yertle the Turtle McConshell.